Our Society lost a great friend and sound advisor whose service and dedication to our project was unwavering throughout his 9 years of involvement. Dalton attended our founding meeting, first as a County representative, then ever since as a Board Member. His tireless commitment and dedicated service is evident in the many areas of the Homestead where he was actively involved as worker, organizer and enthusiastic promoter. His belief in our goals and purpose came from his personal experiences as a farmhand working for the McNaught family in his youth, later as a farmer/ seed grower and neighbor in the same community. His practical knowledge of farming and his other lifelong experiences lent itself to the agricultural , nature/habitat and restoration components of the project. He was instrumental in site clearing, building restoration & repair, land use and agricultural issues, fencing and lake access development and the continuing expansion of our Annual Festival. He brought his tractor, truck, tools & equipment and grandchildren to assist wherever needed. He sought out corporate donations, government assistance & approvals without hesitation to ensure progress. Our latest project of a Boardwalk and lake viewing platform saw him leading the way on this Committee. His keen work ethic inspired our student workers and our volunteers. Our Board will miss his attentiveness and practical approach to the many aspects of our project and he will long be remembered for keeping us mindful of why this Historic site needs to be restored and preserved. 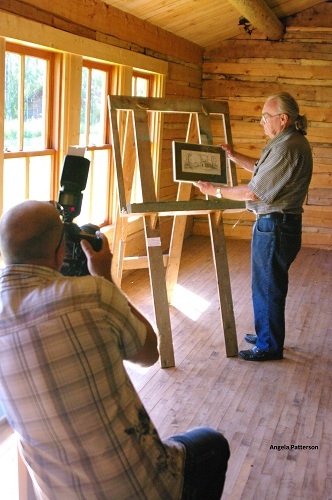 Return from Tribute Dalton Longson to the McNaught Homestead Heritage website home page.